Designed for those who love intense outdoor pursuits such as mountain running, mud runs, endurance and obstacle races, boot camps, and all-terrain biking, Thorlos Outdoor Athlete Socks are engineered for performance that equals and even exceeds your own ambitions. 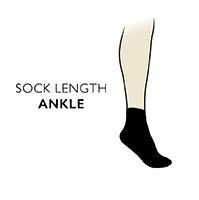 These bold coloured quarter length socks are form-fitting and protective, with compression-grade ankle and arch support to guard the plantar fascia, fight fatigue and even resist bunching and twisting, allied with an ankle/foot transition gusset. The sock tops are reinforced with dirt shields, to keep grit and debris out. The precisely-placed support elements, and light density padding, protects the most ‘at risk’ areas of the feet and lower legs, cushioning weight-bearing body points. Flow-Thru venting and unique Thorwick Cool fibres give theses socks protection against wet feet, with superb moisture wicking and heat retention.